Here’s an example: An event happens to a stock, you make the decision to buy/hold/sell. Generally this decision is a reaction of yours or others to that event. But everyone else makes the same decision with the information about the event. This where every investor, big or small, comes unstuck. Trying to react after the horse has bolted is a flawed investment strategy. Pythagoras is looking when everyone else isn’t. And it’s doing a more that the human mind can – without prejudice and human emotion. Simply put, we are mathematically looking at stocks and predicting events through changes in volatility. We can then predict share price behaviour – and trade ahead of the events. 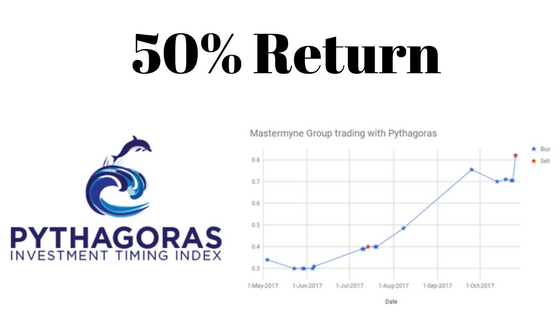 Mastermyne is a stock Pythagoras offers for clients to subscribe to. 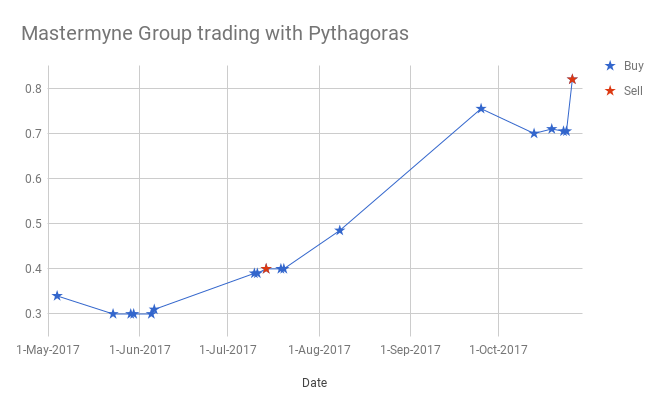 To understand more of how Pythagoras works we are using this stock as an example of trading over the last 6-8 months. The company is a provider of underground roadway development, installation of conveyors, design and engineering of specialised equipment and consumables to the Australian coal mining industry. It’s in an active space. 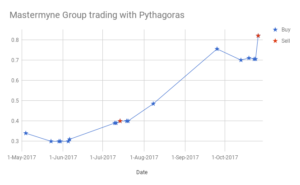 Pythagoras recommendations on this stock have provided great returns for the past 8 months. In the first set of recommendations we have 8 buys at an average of 32 cents and a sell at 40 cents. The profit on those buys amounted to a cumulative 57 cents. Therefore on average each buy made 21% return. In the second set of recommendations we have 8 buys at an average of 60 cents and a sell at 82 cents.The profit on those buys amounted to a cumulative $1.27. Therefore on average each buy made 28.5% return. That is a total return of $1.84 and a return of invested capital of 50% in less than 7 months. Our predictive technology takes a complex snapshot of each stocks historic performance and measures volatility, allowing us to predict events that will affect the stock price.